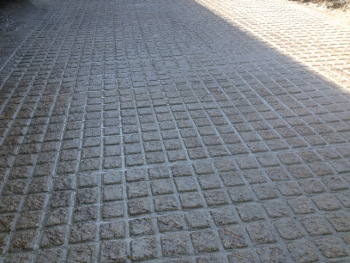 Grooves are cut in a square pattern, so whichever direction the animals move in, grip will be found. Grooves are cut, ½" wide and ¼" deep forming a 2½" x 2½" square. Other size grooves and patterns can be cut on request. The latest pedestrain machines are use, so all but the tightest of areas can be grooved. Tungsten carbide cutters are used, to give you a deep and clean cut grooves. To achieve the best possible results, the area to be grooved needs to be scraped down and thoroughly washed, idealy pressure washed. The cleaner the concrete the better the contact the machine has with the concrete surface, helping to achive the best possible finish. A water supply will be needed whilst grooving is taken place.